John Hay was born to convicts, Robert Hay and Maria ( Hopper Hazelwood) Hay on the 13th April 1816 in New Norfolk in what was still then known as Van Diemen’s Land, now Tasmania. I imagine another dark haired tousle headed child who toddles around in his well worn smock calling after his older sister Mary who would die when he was only three or four. He might not even remember her. His sister Jane and brother William likewise would make up his party of friends. Certainly until his younger brothers and sisters arrived as they did in ever increasing number. Their mother Maria would have tended a busy and I daresay noisy small home. With so many small children to look after and a husband who was out farming their virgin land all day and into the late afternoon she would have been kept busy with boiling clothes and linens in a copper over the fire. The house was likely a wooden structure with a stone fireplace that alternately provided heat to stave of the freezing cold of a Tasmanian winter and belched smoke into the place. Quite possibly it was a one or two room home with a curtain divide between the sleeping areas made up of blankets or canvas. If times had gone well then Robert would have been able to eventually build a separate room. Highly likely that the floor was hard packed dirt that obtusely Maria would have swept with a broom made of brush from the local flora. What a day it must have been when a wood floor would have eventually gone in! The home meals also would have been cooked in the fireplace and would have been made up of the simple fare that they would have available to them until the home vegetable gardens were able to take off. Fruit trees would need seven years from growth for many of them before they would yield any fresh produce. A variant of bread that would have been a mix of a scone like damper and a hard tough textured bread that could be torn or sliced into thick slabs. For some years they would have been reliant on the stores in Hobart providing them with salt, sugar and flour until such things were able to be provided for locally. If they were lucky they might have found the odd beehive for sweet honey or a neighbour may have kept bees for this purpose. Water fortunately was nearby but would still have had to be brought up to the homestead by manual means in those earlier days. Wash day for Maria must have been a day of rough soap and sore backs. Imagine trying to get washing dry in that frequently wet weather so typical of our most southern state. It is also highly likely that Maria had to help her husband run their small farm of thirty acres. Certainly the vegetable garden would have been her responsibility. Thankfully the river flats they were on were very fertile so setting up a successful food garden and eventually a plentiful supply would have been more possible than for other pioneers in less friable soil. Neither would ever be considered in society, a gentleman farmer and his good lady. Both were from the convict class and both knew what it was to have to curry favour and curb one’s tongue against injustices to be be able to attain even the most basic acceptance by those in power. Their friends and neighbours in those days would have been made up by other convicts and ticket of leave men and women. It was a few years before the more respectable settlers arrived. Friendships must have been forged through necessity and a shared experience. As many of the convicts who came to Van Diemen’s Land were political expatriates were there hot discussions held over a clay pipe and a fire as to the cruelties of the ruling classes back home in England and Ireland, Scotland and Wales. How much desperation was experienced by these men knowing that there was never a chance that they could return home. In those early days of pioneering families your success was entirely built on your relationships with those around you. If you did not garner the support of the authorities you were guaranteed a miserable life on the stores with no hope of escape or advancement. If you continued your criminal pursuits you might well find yourself sent out to one of the nearby barbaric islands of incarceration for the incorrigible. A life of flogging, merciless treatment and untimely death through disease or misadventure beckoned. At best you might get away and be a bushranging bandit whose life would also be short and rough. The local indigenous people of Tasmania themselves were treated harshly and hunted into extinction. John’s parents knew well enough that their best chance for opportunity for themselves and their growing family was to follow the mores of the day and buckle down to the task at hand. The Hay family were most definitely prolific. John was the fourth of twelve children to John and Maria. Mary Ann Hay, b. 1810 (d. 1820) aged ten, Jane Hay b. 1812, William Hazelwood Hay b. 1814, Robert Hay b. 1818 , James Hay b. 1821, Elizabeth Hay b. 1823, Maria Hay b. 1825, Caroline Hay b. 1828, David Hay b. 1830, Thomas Hay b. 1832, Anne Hay b. 1835. John also had two half-sisters left behind in England when his father had been transported. Barbara Hay b. 1798 and Ann Hay b. 1801. I wonder did John ever know about these two lost sisters? Did his parents ever talk about their homelands of Scotland and England. I imagine Robert must have as there is a reference to his Scottish heritage at his graveside. Would Maria have considered the distance of her own mother and family? Knowing full well that they would never be able to be together again. There was no school in New Norfolk until 1849. What sort of education John and his siblings would have received would have depended entirely on their own parents knowledge and the shared knowledge of their fledgling community. John Hay the son of these convicts would have had limited opportunities to expand his own wealth with anything other than hard graft. The year of John’s birth also heralded the beginning of the second newspaper in VDL – The Hobart Town Gazette. This was started by Andrew Bent, himself a convict who had been transported for life for burglary. Those very early editorials that appear around the time of John’s arrival cover a wide variety of stories that give some colour and form to the goings on of the day. Whales were reported as appearing in great numbers in the nearby waters. Wheat assizes were reported to give the colonists an idea of what was held in the stores and what would be available for distribution. Colonists were encouraged to report neglectful and runaway convicts to the authorities and of course bandits (not yet bushrangers) were reported in their activities through the wilds of this very new settlement and it’s outreaches. The wild dog’s or wolves were a known and reported nuisance and their culling encouraged. These of course were the unfairly maligned and hunted Tasmanian tiger or as we now know them by their proper name Thylacine. Now hunted into extinction. Sophia Morgan who was to become John’s wife was born on the 27th January 1817 in Middlesex, England. Sophia was the daughter of John Morgan and Susanna Carter. 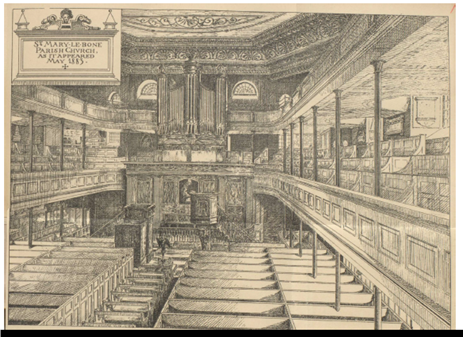 She was baptised on the 16th March 1817. in St Marleybone. The family were living in the parish of St Marleybone in the county of Middlesex. Sophia’s father’s occupation was given as a Labourer. These details are recorded in the parish registers. Her childhood must have had some good fortune in it as she was as unlikely a candidate as any child in the working classes and given the opportunity to learn to read. In the twenty or so years leading up to her birth the area Sophia grew up in underwent considerable change like much of England. The rural areas were enclosed and farming agriculture for the poorer classes became a more difficult attainment. St Marleybone or as it is now known Marleybone was a district of London and places like Portland Place, Harley Street and Wimpole Street became the exclusive residential area for wealthy families. Huge homes of intricate stonework and glass were erected in areas that had supported the poorer farmers. The poor were pushed out and as always happened they became disenfranchised and over-crowded into poorer and less hygienic living conditions. Disease and the London damp meant a higher mortality particularly amongst the young and old. Desperation led way inevitably to opportunistic crime. The Duke of Portland who owned much of the area did little to change the situation other than provide ever increasing opportunities for the area once named for St Mary’s Church to become more and more exclusive and it’s poorer people were forced in a kind of exodus from their traditional homes. A life of servitude for the ruling class was the best opportunity for these peoples. St Marleybone at this time also enjoyed a somewhat rakish reputation as somewhere that entertainment of unusual means could be found. Bear baiting and pugilistic prize fighting engagements between both sexes could be observed in Marleybone Gardens and Marleybone fields. Somewhere in the middle of all this a dark haired grey/blue eyed young teen who was employed as a Servant in one of these homes ended up in a great deal of strife when she was accused and convicted of theft. On the 5th April 1832, during the 1832 sessions at The Old Bailey in Middlesex, Sophia is brought before the courts charged with larceny. She was charged and subsequently convicted of having stolen a box of linen of wearing apparel. In my opinion at least she made a decent haul of it! Two sheets, two pillow cases, six table cloths, seven napkins, thirteen towels, three shirts, three handkerchiefs, five pairs of stockings, six shirts, one habitshirt, one waistcoat. All of these the property most likely of her employer Lord Frederick Beauclerk. Beauclerk was a deeply disliked cricketer and ‘dull’ clerygyman and son of an Earl, who was remarked for his ‘foul mouth and bitter temperament’. He was also an underarm bowler! In fact he was so disliked that when he died the Times Newspaper in England refused to write him an obituary. Did Sophia do it? Or did her employer in a fit of temper make the accusation. One of his contemporaries wrote about him: My Lord he comes next, and will make you all stare . With his little tricks, a long way from fair. If she did do it? Good on her she got the better end of the deal and was remembered far better by her contemporaries when she died. As a result of this hearing Sophia was taken from her family and transported to Australia for seven years. Sophia was fifteen years old. On the 15th September 1832, Sophia boards the Frances Charlotte bound for Van Diemen’s land with 95 other female convicts. The ship arrives in Hobart town on the 10th January 1833. Sophia Sailed from (Downs) on route 117. The Shipmaster was A. Smith. The ship surgeon was John Osborne. The gaol report for her was well behaved. The Surgeon reported that she had been orderly on board and that her character was good. Sophia’s physical appearance was described as: Estimated to be born in 1814 and aged 18 (she was actually 15). Body marks – thickly pockpitted (had she survived smallpox I wonder? ), eyes – gray/dark blue, hair – brown, height – 5 feet. Family – Single/unmarried. She was recorded as being able to read. Religion given as Protestant and occupation a Servant of all work. Not long after her arrival in 1833 Sophia was allocated to Mr W. Able in the Back River district of New Norfolk to work as a Servant. During this period of time Sophia had begun a relationship with a neighbour, John Hay and was living with him on his father’s property. They had a child together – Mary Ann Morgan. It doesn’t appear that Mr Able/Abel was particularly bothered about it as he allowed it for around thirteen months and didn’t raise a fuss. In the July of 1835 the authorities in Hobart had been made or had become aware that Sophia was ‘in neglect of her duties’. What was considered the major sticking issue was not her duties so much as the fact that she had borne a child. Both John and his family put together a petition, pleading on Sophia’s behalf and Mary Ann’s that they be able to stay with them at Back River. Transcript of Sophia Morgan Conduct Record from Tasmania Archives: (I’ll save you the trouble finding it page by page as I did- http://search.archives.tas.gov.au/ImageViewer/image_viewer.htm?CON40-1-7,312,86,L,49) The dates are wrong. The author wrote 1833 but they meant to write 1835. 1833 is when she arrived. MORGAN Sophia Frances Charlotte 10 January 1833 Middx GD 5 April 1832 April 18 1833 W Abel Neglect of duty Rep@ J England / June 1 1833 W Abel Neglect of duty Rep@ J Fairweather / July 22 1835 Brought up from the service of Mr Robert Hayes of the Back River having been allowed by her Master Mr Wm Abel Junior to remain in Mr Hayes service for about 13 Mos without any authority from the Govt and having been delivered of a Child at Mr Hayes House in the Month of August last, Mr Hayes appears and produced a Written Authority signed William Abel Junior, To be returned to the F Factory with her Infant for the disposal of the Princip. Supernit J Mason. Cert 14/2/48 . This was all to no avail and she was sent back to be incarcerated with her child at the Cascade Female Factory in what was referred to as reformatory for convict women. At the muster in 1835 Sophis was recorded as being in the house of corrections. The female factories were a dangerous place. 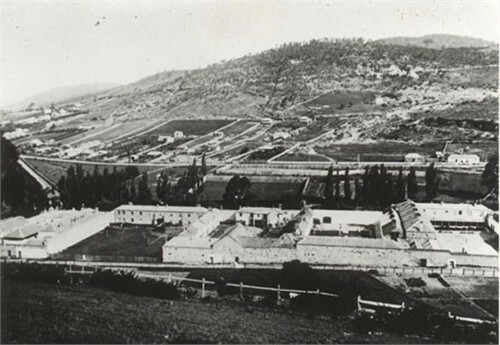 In 1827 Governor Arthur ordered a female factory to be built at Cascade south of Hobart. This became known as the Cascades Female Factory and had originally been a brewery. There were three classes of convicts held here. Those not yet assigned. Those who due to misconduct, were to be scheduled for punishment. Then there was the third class that Sophia fell into, those unfortunates who had dared to become pregnant or with small children and no support. These latter women were given the task of hand loom weaving coarse prison cloth and other menial tasks meant to degrade and punish as an example to other women. These tasks were undertaken in damp and decrepit conditions. Poor food, the risk of sexual exploitation, hard and menial work, poor sanitation, little medical care or treatment and disease running rampant through the infant population. Overcrowding and poor treatment of the inmates and the children. The mortality rate amongst the most vulnerable being the babies and children was unreasonably high. Care for pregnant and new mothers was almost non-existant. The above clip on YouTube gives a snapshot of what it was like for women from the Frances Charlotte in 1833. Sophia was on this ship. There is a memorial at the site that states “More sinned against than sinners”. I think that reflects the truth. The location of the Cascades Female Factory is now 16 Degraves Street South Hobart. Many of the buildings and artefacts from the time of Sophia and the female convicts are on display and available for tours etc. The work done by the volunteers of the Female Convict’s Research Centre, I greatly admire. What they have done for our often under-represented convict women in Australia is nothing short of a national treasure. That Sophia survived the factory and was able to eventually leave for safety with Mary Ann and return to Back River was no small effort on her behalf. As a descendant of Mary Ann I’m eternally grateful to Sophia for her fortitude during these difficult years. On Friday the 2nd March in 1838 The Hobart Town Courier lists Sophia Morgan as having received her ticket of leave. John had remained true to Sophia and had applied for them to be able to get married. This was necessary at the time with all convicts and ticket of leave holders. John who is recorded as John Hayes (not Hay) a free man on the 1st September 1838 applies for permission to marry convict Sophia Morgan. Approval for this marriage is given on the 17th September 1838. They are married on the 5th October in New Norfolk. Their second child Robert Hay beats them to the alter and is born on the 27th September 1838. Unlike his older sister the difference in a few days between his birth and their wedding, Robert is given his father’s surname when registered. From here on John and Sophia continue to build on their growing family to the grand number of twelve children. Jane Hay b. 1840, William Henry Hay b. 1842, Frances Maria Hay b. 1844, Caroline Hay 1847, Phoebe Maria Hay 1849, Isaac John Hay b. 1851, George Frederick Hay b. 1853, Thomas James Hay b. 1856, Frederick (Frank) Edwin Hay b. 1858, Ralph David Hay b. 1862. The Hay family are listed on Tasmania’s colonial heritage website as a pioneer family in Tasmania. Of their children, Mary Ann Morgan (Hay) goes onto marry Francis Kingshott. Robert Hay marries Louisa Johnson. Jane Hay marries James Thomas Bradshaw. William Henry Hay marries Sarah Stanley. Frances Maria Hay marries Samuel Sargent. Phoebe Maria Hay marries John Ware. Isaac John Hays marries Susannah Eaton. George Frederick Hay marries Mary Jane Oakley. Frederick Edwin Hay (known as Frank) marries Isabella Young. Ralph David Hay marries Linda Rose Fenton. On the 9th June 1887 John died in New Norfolk aged 71 from cancer of the stomach and liver. HAY – On June 9, at Back River, New Norfolk, John Hay, aged 72 years. The funeral will leave his late residence at 2 p.m. on Sunday next. Friends are respectfully invited to attend. John is buried at Back River Methodist in New Norfolk. 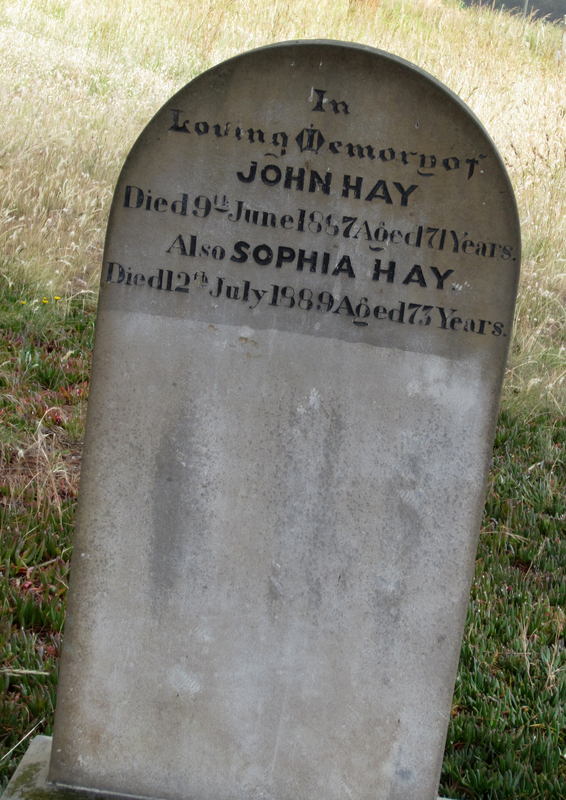 Sophia died on the 12 July 1889 at the age of 73 and is buried with her husband John Hay at Back River Methodist, New Norfolk. Thomas James Hay married Louisa Margaret bishop in 1883 New Norfolk. They are both buried at back river. Thank you Melita, I’ve adjusted that part. Cheers.